Stanley Harry Hawley’s melodramas for solo piano and narrator are passionate and haunting. This concert will feature two of his works, including his setting of Edgar Allan Poe's gothic masterpiece "The Raven". Alongside these theatrical gems, we are performing a collection of Late 19th Century English chamber works for piano and strings. Come and enjoy these passionate, beautiful and haunting works. BYO drinks and nibbles (we'll be selling simple snack plates for the night performances but you can BYO finger food too). We invite our audience to dress up for the occasion - Edwardian, Victorian or Steampunk all welcome. Written in 1653 by English playwright James Shirley, Cupid and Death is a masque that combines music, dance and theatre. Composers Matthew Locke and Christopher composed the music for this comic, enchanting work. 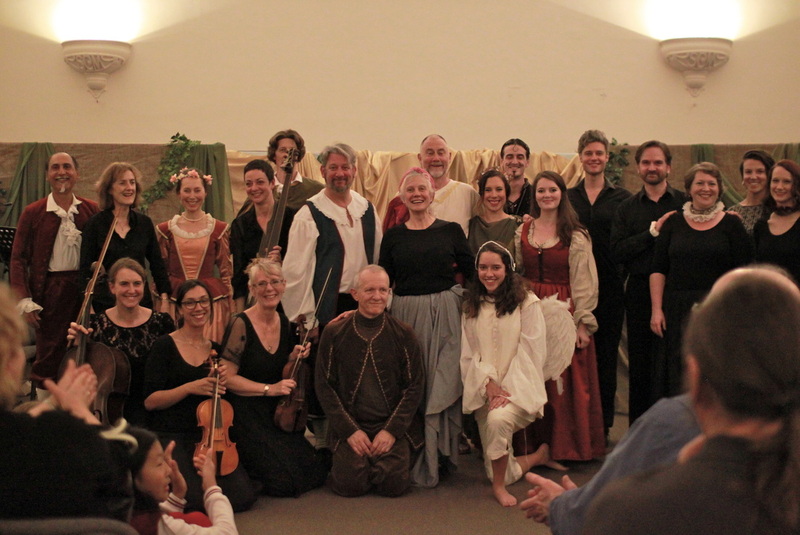 We performed Cupid and death at Glebe Cafe Church in May, 2014 with an impressive cast of singers, actors, and musicians on period instruments. Joining us for our debut production was The Early Dance Consort performing period dances choreographed by Fiona Garlick of The Early Dance Consort. "I would have liked to tell each one individually how much I enjoyed the performance but had to get away early. It was utterly engaging and a real showcase for everyone's skills. I thought it would be good but it was even better than I had imagined. Really terrific. What a bunch of professionals. Thanks for a lovely experience." "I thoroughly enjoyed the performance. As I said to (MD) Richard Black on the night, the balance of music, dancing and acting was just right!" "Seeing the photo has brought back the feeling of joy and lightness I felt during the performance. Interactive audience participation with the arrows was fun... Great singing, orchestral and performing from you all. Great relaxed space, it was like being in someone's lounge room." To read more about our performance of Cupid and Death, read our program notes and synopsis, visit our production website: www.cupidanddeath.com. 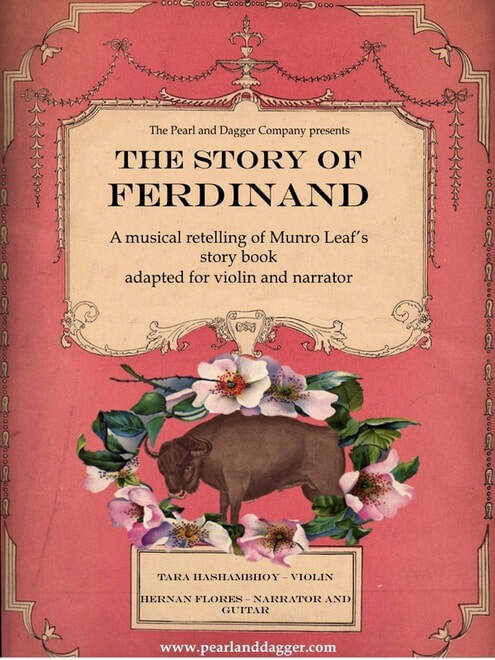 Alan Ridout's Ferdinand is a musical retelling of Munro Leaf's enchanting picture book The Story of Ferdinand, which has been loved by generations of children. Ridout's version is set for solo violin and narrator, and features Leaf's original words. This performance also features traditional Spanish and Chilean folk songs, performed by Hernan Flores (guitar, vocals) and Tara Hashambhoy (violin). This is our debut children's concert. The Pearl and Dagger Company perform works that blend musical performance with theatrical elements. In this performance, you will meet many characters, including the gentle, dreamy Ferdinand, his worrisome mother, the proud matador, and one tiny insect. This performance is available for primary schools and early learning centres. Please email us or call for more information.